The art of presentation differs to the art of conversation. But there is a link. A very important link. So, when you want to know how to be a dynamic communicator, you have to understand that link. Aim to focus on the three key elements when you want to be a dynamic communicator. These are the three key elements that you need to manage. So, first, master these 3 elements. 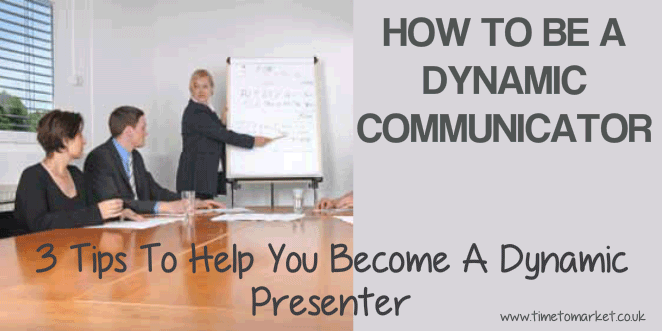 Then learn how to be a dynamic communicator. And finally, make things happen with your communications. Conversation. There’s more to conversation than chat. It’s the best way to establish common ground, interests or goals. It’s a way to map out shared experiences, occupations and contacts. And it’s personal, involving eye contact and human engagement. So, is it any wonder that the speed-dating industry has seized upon it? As a presenter, it pays to have some brief conversations with your audience members before you present. Because it makes it more personal. And because there’s a direct benefit to you and your audience. Listen. Common to both conversation and presentation, good effective listening is key to both. In conversation you are attuned to the interests of your interlocutor. You speak. You listen. And with presentation you also have to be attuned to the needs of your audience. So, listen to and observe their feedback. Listen to and respond to their questions. And, finally wait for their reaction. Presentation. Your goal as a presenter, PowerPoint or otherwise, is for everyone in your audience to believe that you are having a one to one conversation with them. One to one many times over. You speak. They listen. They engage. And, they participate. That’s certainly the case with this iPad 2 presentation with Steve Jobs. Your audience knows the rules of the game. They’ll only speak when you ask questions. But it’s not an unequal relationship. It’s not one-sided. You need them. Your audience expects you to listen to them. To be receptive. But they also expect you to anticipate their listening needs…to adapt your pace, to pause and wait for their understanding. Because that’s listening. These three elements of dynamic communication—conversation, listening and presenting—involve the same high regard for your audience. And that’s the link. So, have a high regard for your audience. Dynamic communicators have that high regard and thus, aim to master all three. You can always attend a PresentPerfectTM course for effective presentation training to learn more about how to be a dynamic communicator. As an alternative a one to one coaching session could give you all the skills you need to become a more dynamic presenter. Telling It Straight is our very own presentation tips newsletter. Packed with skills tips to help you with your next presentation, why not receive it this month?